Bassnectar will be performing on October 10, 2009 at Neighborhood Theatre in Charlotte, NC with special guest DJ Vadim and Mindelixer. This is an all-ages event. 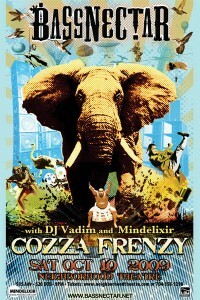 The tour celebrates the release of Bassnectar’s new studio album, Cozza Frenzy, available now at music.bassnectar.net, with CDs in stores on October 27th… or you can just snag your copy at the show. Neighborhood Theatre is located at 511 E. 36th St., Charlotte, NC 28205. After the PK sound rig gets going, the Theatre may wobble down Davidson and bounce its way to the center of Highland Park.